So, how do you know if that remote is working? Fire up the camera app on your device, and point the remote at the camera. Start pressing buttons on the remote. You should see a bright (or dim) pulsing light depending on the strength of the batteries. You can also use this trick to test individual buttons on remotes that have suffered accidental drops or beverage spills (or toddlers/pets chewing on them). If you need to get fancier in your reception of IR signals, you can use a Palm application called IR monitor on any IR enabled Palm device. It let’s you observe the actual IR modulation, so you can really see what’s going on with your remotes. And don’t forget, you can always use your handheld or Treo as a remote, using software such as Novii Remote. I recently picked up a couple of Logitech Quickcam IM OEM versions from a local retailer for doing Videoconferencing/Video Phone calls. As you can see from the picture below, it is basically a ball that sits in a rubber “cup”. Now, because that ball is so light, it can move if there’s any kind of tension on the cable, or if you hit your desk, or if your floor bounces while you walk… and so on… So, you may be having a video conference, and your camera will drift off of your face and point at the walls, the ceiling, or wherever. So, how do you keep it from moving? Well, if you’re using a Logitech webcam, you’re in luck. Most of their models have a standard tripod mounting point on the bottom of the camera ball. That mounting point is a 1/4″-20 thread, meaning you can use a screw which is 1/4″ in diameter, and has 20 threads per inch. So, a quick trip to the hardware store to get some 1/4″-20 screws of 1/4″ to 1/2″ in length, and you will have an easy method to keep your face in place. Just screw it in to the camera head through the base, and tighten it so it’s snug (but not so snug you can’t adjust the camera ball). Using the same idea and some angle brackets (and any necessary washers and nuts), you could also fasten that camera to the wall, a bookcase, a windowframe , or anywhere else you needed to. So, what do you do when you can’t find exactly what you’re looking for? You make it, of course! And so I did. I went down to Home Depot and got a half-inch thick piece of 24″ x 48″ birch plywood and some ABS plastic drain pipe (1 1/2″ diameter), and some plastic spray paint. I cut the wood into two pieces of 12″ x 32″, and two pieces of 12″ x 16″. I then glued and screwed each of the two same-size pieces of wood together, so I had a 1″ thick piece of 12×32″ and a 1″ thick 12×16″. FYI, I’m making two monitor risers; one for my main monitor, and a second one for an auxillary monitor I use for rehearsing my Palm-based presentations. I then proceeded to sand the edges flush using a random-orbital sander and some 80 grit sandpaper. After a finishing sanding with 220 grit, the boards themselves were finished. Using a mitre box and hand saw, I cut the ABS pipe down into (4) 6″ pieces, and (4) 3″ pieces. A small knife and file took off any stray plastic or rough edges. I put the pipe pieces on some cardboard and spray painted them a nice blue that matches the wall colour. While those were drying, I took my electric drill and a 1 1/4″ hole saw to a scrap piece of 2″ w MDF from a previous home-improvement project. I drilled out 8 circles. Those circles would eventually be the mounts for the legs of the monitor riser. Since the inner diameter of the ABS pipe is slightly less than 1 1/4″, I had to take a file and sand paper to slightly reduce the diameter of the MDF circles so they would fit into the ABS pipe. After a fair bit of sanding, all the circles were capable of fitting into the ABS plastic pipe. I marked the locations of where I was going to put the legs on the bottom of the board, and pre-drilled a small hole for the screw. I glued the bottom of each circle, and then affixed it to the plywood using a single screw through the hole where the hole saw pilot had run through. Four circles later I was ready to install the pipes. I fit each pipe leg over top of the MDF circle and pressed down firmly. They’re such a tight fit that no other form of fastening is required. 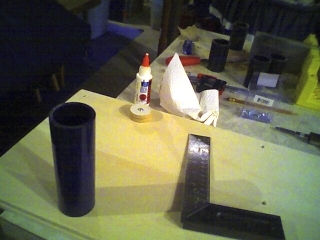 The picture above shows one of the MDF circles, and one of the affixed ABS pipe segments. I finished installing the rest of the legs, then applied a few coats of clear Varathane, and the DIY monitor riser is complete! A tip for you; to avoid brush strokes and get a really smooth finish with Varathane, sand lightly with 400 grit sandpaper between coats and wipe with a damp paper towel. To get the legs attached and fully seated, I kneeled on the riser; if it can hold my nearly 200 lb frame, I don’t need to worry about my monitor! 4 felt circles needed to go on the bottom of the legs, and now the riser is ready to go onto the desk. 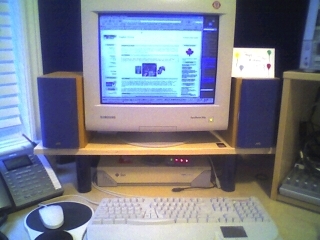 The picture below shows the finished monitor riser, with speakers flanking the monitor. As you can see, there is lots of room on either side, and underneath. It’s been incredibly sturdy since I put it up on the desk, and lets me make effective use of vertical space on my desk. It’s also wide enough that if I were to ever go to dual LCD monitors, they’d fit. Hope this inspires you to create something effective for your workspace; don’t settle for being uncomfortable, when $20 of supplies and a bit of time is all it takes.